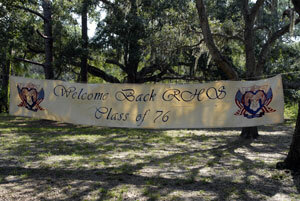 Our last reunion event took place today at Oscar Sherer State Park. As has been normal this weekend, the committee did a great job of planning and preparing. The meal was ribs, chicken, slaw, etc. 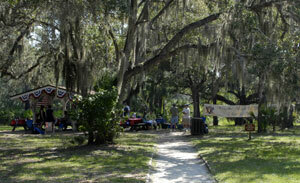 from The Oaks BBQ. We had a lot of food left over but fortunately someone brought zip loc bags so we all were able to do take out. I just got into my Mother-in-law’s house in Ft. Lauderdale and had it for supper. Mmm good. I think we had about 50 people show up today and it was a really nice and relaxing way to wind down the weekend. The park was beautiful. Bennie had arranged for some canoes and a number of us were able to go out on the creek and paddle around. I didn’t bring my camera in the canoe but Bennie and Liz had there’s. I’m counting on them to email me one.